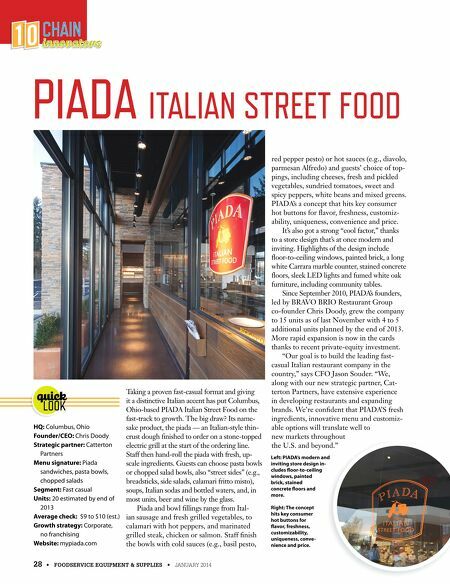 28 • FOODSERVICE EQUIPMENT & SUPPLIES • JANUARY 2014 Taking a proven fast-casual format and giving it a distinctive Italian accent has put Columbus, Ohio-based PIADA Italian Street Food on the fast-track to growth. The big draw? Its name- sake product, the piada — an Italian-style thin- crust dough fnished to order on a stone-topped electric grill at the start of the ordering line. Staff then hand-roll the piada with fresh, up- scale ingredients. Guests can choose pasta bowls or chopped salad bowls, also "street sides" (e.g., breadsticks, side salads, calamari fritto misto), soups, Italian sodas and bottled waters, and, in most units, beer and wine by the glass. Piada and bowl fllings range from Ital- ian sausage and fresh grilled vegetables, to calamari with hot peppers, and marinated grilled steak, chicken or salmon. Staff fnish the bowls with cold sauces (e.g., basil pesto, red pepper pesto) or hot sauces (e.g., diavolo, parmesan Alfredo) and guests' choice of top- pings, including cheeses, fresh and pickled vegetables, sundried tomatoes, sweet and spicy peppers, white beans and mixed greens. PIADA's a concept that hits key consumer hot buttons for favor, freshness, customiz- ability, uniqueness, convenience and price. It's also got a strong "cool factor," thanks to a store design that's at once modern and inviting. Highlights of the design include foor-to-ceiling windows, painted brick, a long white Carrara marble counter, stained concrete foors, sleek LED lights and fumed white oak furniture, including community tables. Since September 2010, PIADA's founders, led by BRAVO BRIO Restaurant Group co-founder Chris Doody, grew the company to 15 units as of last November with 4 to 5 additional units planned by the end of 2013. 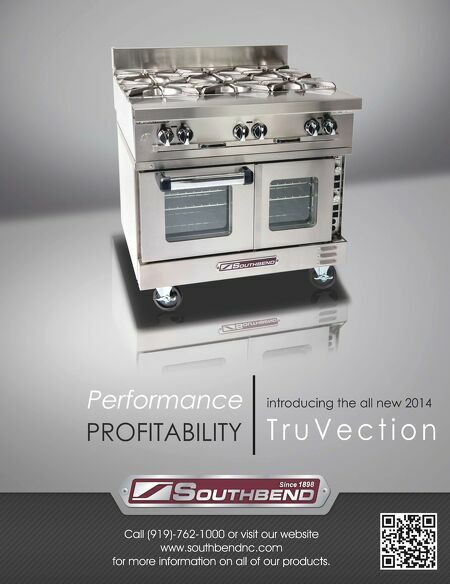 More rapid expansion is now in the cards thanks to recent private-equity investment. "Our goal is to build the leading fast- casual Italian restaurant company in the country," says CFO Jason Souder. "We, along with our new strategic partner, Cat- terton Partners, have extensive experience in developing restaurants and expanding brands. We're confdent that PIADA'S fresh ingredients, innovative menu and customiz- able options will translate well to new markets throughout the U.S. and beyond." CHAIN CHAIN PIADA ITALIAN STREET FOOD HQ: Columbus, Ohio Founder/CEO: Chris Doody Strategic partner: Catterton Partners Menu signature: Piada sandwiches, pasta bowls, chopped salads Segment: Fast casual Units: 20 estimated by end of 2013 Average check: $9 to $10 (est.) Growth strategy: Corporate, no franchising Website: mypiada.com quick LOOK Left: PIADA's modern and inviting store design in- cludes foor-to-ceiling windows, painted brick, stained concrete foors and more. Right: The concept hits key consumer hot buttons for favor, freshness, customizability, uniqueness, conve- nience and price.